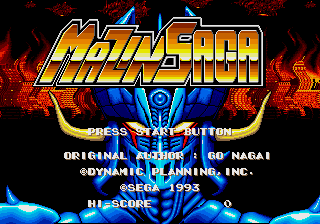 Mazin Saga: Mutant Fighter, called MazinSaga (マジンサーガ) in Japan and Mazin Wars in Europe, is a beat-'em-up developed by Sega in 1993 for the Sega Mega Drive to tie into the MazinSaga manga series. In 1999, the Biobeast Force, led by Godkaiser Hell, swiftly and successfully destroys the Earth's current state of existence in a matter of months, driving the few survivors underground. One such survivor, Dr. Kabuto, creates the Mazinger-Z, a suit of armor he wears to become capable of battling the Biobeast to save what's left of Earth. Controls are typical for a Sega beat-'em-up: performs the special attack, attacks (typically using Mazinger-Z's sword), and jumps. The special attack is 3 seconds of swinging your sword around in a circle; performing the special attack costs life energy. Game Designed by: Team "Saga"
Program and Graphic: Almanic Corp.
Planning and Production: Dynamic Planning, Inc.
Main article: Mazin Saga: Mutant Fighter/Magazine articles.